(Nanowerk News) Members of Lawrence Livermore National Lab’s Additive Manufacturing Initiative are among a group of researchers who have developed 3D printed materials with a unique property -- instead of expanding when heated, they shrink. 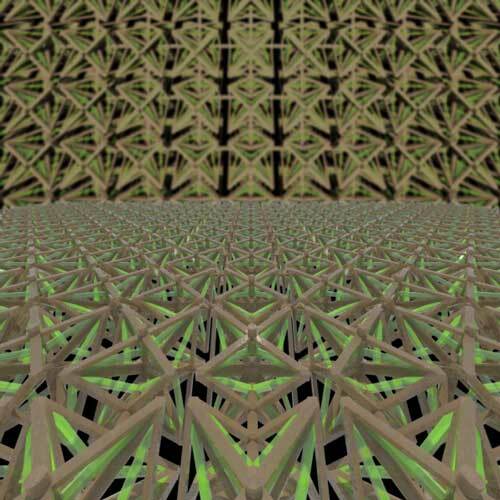 In a study published on Oct. 21 by the journal Physical Review Letters ("Lightweight Mechanical Metamaterials with Tunable Negative Thermal Expansion"), LLNL engineers, along with scientists from the University of Southern California, MIT and UCLA, describe the 3D printing of lightweight metamaterials with negative thermal expansion that can be “tuned” to shrink over a large range of temperatures. In the paper, the researchers demonstrate a bi-material microlattice structure, printed from polymer and a polymer/copper composite material that can flex inward, causing the structure to contract when exposed to heat over a range of tens to hundreds of degrees. Researchers note the study may be the first experimental demonstration showing large tunability of negative thermal expansion (NTE) in three Cartesian directions of microlattice structures. Possible applications for the metamaterials, the researchers concluded, could come in securing parts that tend to move out of alignment under varying heat loads, including microchips and high-precision optical mounts. Jonathan Hopkins, a former LLNL postdoctoral researcher who is now an assistant professor of mechanical aerospace and engineering at UCLA, designed similar structures in a separate paper using a human interaction-based approach rather than computer-driven. Hopkins, who joined the UCLA faculty in 2013, won a Presidential Early Career Award for Scientists and Engineers (PECASE) in February for research directly tied to the latest paper. The thermal expansion also can be zero or positive depending on how the geometry and topology of the structure are engineered, Hopkins said. A team at MIT, led by associate professor of mechanical engineering Nicholas Fang, 3D-printed the microlattice structures using a projection microstereolithograpy process. USC assistant professor of civil and environmental engineering Qiming Wang, the paper’s lead author, worked for Fang as a postdoc. Wang said the microstructured metamaterial could be used in dental fillings, which tend to move or crack when a person eats something hot, to fill in small gaps in bridges or buildings that are normally left open to account for thermal expansion, or in precision devices such as atomic-force microscopes. The study is part of a five-year Defense Advanced Research Projects Agency (DARPA) Defense Sciences Office (DSO) program to research materials with controlled microstructure architecture.